Mild solvent and eco-solvent inks are rated for outdoor use up to three years without lamination. So why bother laminating an eco-solvent print? There are three good reasons; two old and one new. The two established benefits of lamination are extended UV protection and added abrasion and chemical resistance. The new reason to laminate comes from a new category of over laminate films that add unique visual characteristics to the finished product. We’ve added two such special effect over laminates to the spring catalog; PrismJET CL3D and MACtac Silver Metallic Enhancers. What’s so special about them and what visual effects will they add to your prints? PrismJET CL3D is a glossy 3mil calendared polypropylene film with a clear, permanent, pressure sensitive adhesive. The polypropylene face stock gives it an unusually smooth surface. What makes it visually unique is the holographic 3D pattern embossed into the face film. This 3D effect gives prints a unique depth resembling bubbles under the ink (Fig 1). It’s ideal for novelty graphics like custom car tags and retail promotional and P.O.P signage. As any overlaminate film would, it also adds longer outdoor life and protection from dirt, grubby fingers, and detergents. The 3D effect also adds considerable eye-catching ‘pop’ to your prints. If you’re looking for a way to distinguish your decals, PrismJET Holographic overlaminate is hard to beat. MACtac Permacolor Silver Metallic Enhancer is a 3 mil cast PVC vinyl with a permanent acrylic adhesive. It’s rated for five years outdoors, so it provides both abrasion and UV resistance. Besides the fact that it’s a 3mil cast vinyl, what’s the added benefit? As the name implies, it has metal flake embedded in the face film so that it imparts a shimmering, metallic finish to your laminated prints. You could go out and buy a fancy new metallic ink printer and suffer the added costs, greatly reduced print speeds, and more frequent repairs associated with those machines. Or you can use your trusty PrismJET VJ or Mutoh ValueJet without sacrificing speed, quality, or reliability– and add metallic accents by laminating with MACtac Silver Metallic Enhancer. Despite the cast construction, the metal flake content makes it somewhat less conformable than typical cast vinyls. So it’s only approved for application on flat and moderately curved surfaces. The overlaminate film has been cut (shown by the blue square) exposing the registration mark. Unique overlaminate films can add a wrinkle to your print and cut workflow. Laminated contour-cut decals are generally printed, allowed to outgas, then laminated and cut. The vinyl cutter must be able to read the registration marks through the overlaminate film. This is usually not a problem. But when the film has a light diffraction element, it may be more challenging. There’s a simple solution. Before you laminate the print, cover the registration marks with a low tack masking tape. Use a piece large enough to completely cover the square area designated by the marks. After laminating, you will be able to clearly see and feel the tape squares under the film. Using an X-acto or other art knife, run the tip of the blade around the raised square, and carefully cut through the film. Then peel the film and tape away, exposing the registration marks, which are now uncovered and clearly visible (Fig 2). Proceed as normal, making sure you set your cutting force and blade depth sufficiently to cut through the laminate and score the vinyl beneath. 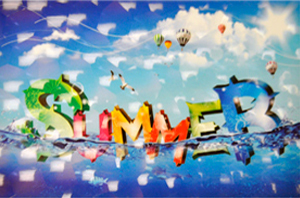 Lamination is still a good idea to add more outdoor life to your eco-solvent prints. It also helps to reduce wear from abrasion and cleaning for fleet graphics, vehicle wraps, marine graphics, and floor decals. Now you have another good reason to laminate; the right overlaminate film can add value and ‘pop’ to your prints.